I’m lucky enough to be married to an extremely observant woman. While we were touristing around downtown Lahaina, Maui, my wife saw a poster for David Sedaris doing a show at the Maui Arts Center in just a few days. She knows I’m a fan and asked if I wanted to go. I was hesitant to put up the money just to hear an author read — but who am I kidding, I love David Sedaris and have since the first time I heard him on This American Life so many years ago. 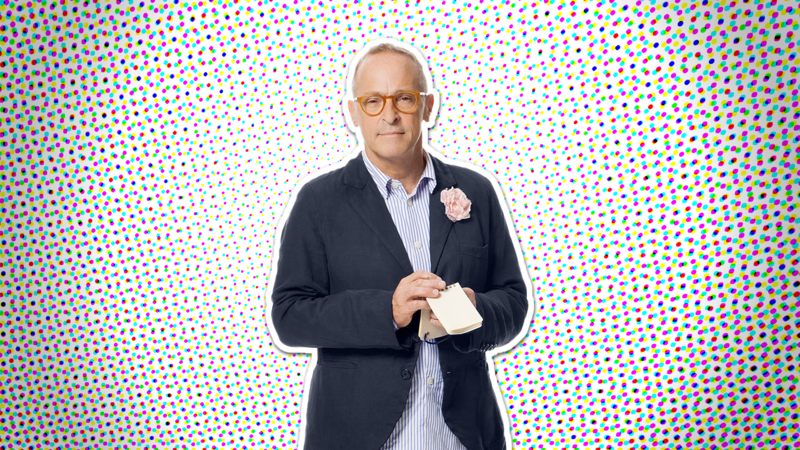 It turns out, it was money well spent, because Mr. Sedaris didn’t take long before he was sharing his list of money making ideas. I was in my Sussex kitchen not long ago squinting at what was either a pheasant or an armless troll racing across the road in front of the house when I got the idea for prescription windows. It would be perfect for people like me who don’t want to wear glasses indoors and so I mentioned it to my friend Ingrid who said, “Oh, that’s brilliant.” She’s one of those women who will support you in just about anything you do. Slap some cheese between two slices of bread and it’s “My God, you’re amazing!” Calm down I sometimes want to say. I didn’t invent the sandwich — I just did what other before me have. This time though, I felt the praise was justified. And so, I put prescription windows on my list of million dollar ideas, realizing hours later that what works for me would not work for Hue, or any of our frequent house guests who have different prescription problems or none at all. Still they might be good for a near-sighted loner who never has any company so I left them on the list. Right below cigarette butts with seeds in them. And after a brief segue from some other million dollar ideas into stories about how cheap some people can be, he finished with a short digression about how his husband doesn’t like to admit how much he appreciates their wealth but that when it comes to million dollar ideas maybe his husband could give it a try. It was a brilliant story. The University of Lethbridge is putting on the musical “Hair” (wikipedia entry). It runs from Tuesday, February 9th to Saturday the 15th. If you haven’t already, get your tickets fast because they’re almost sold out. I know a few of the actors and will be there opening night. It should be a lot of fun. Season 6 of Lost premieres tonight. Enjoy this fan made primer, Flight 815 Crash in Real Time. Lately I’ve been watching reruns of Star Trek: TNG (season 6) and I came across Data’s poem, Ode to Spot. Somehow it seems better 17 or so years later. A group of friends in San Fransico built a giant ball of lego, dressed one of the friends up as Indiana Jones and then had him run from the ball. “Fun times”. 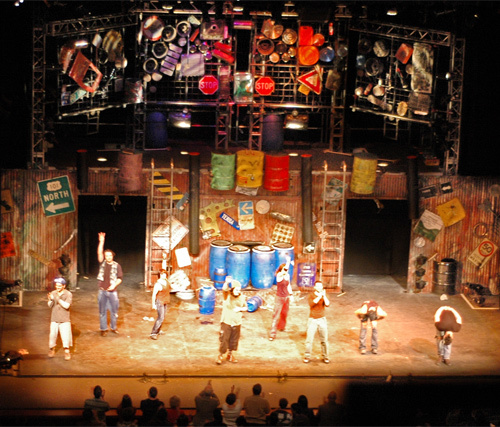 Last night I attended Stomp in Calgary at the Jubilee Auditorium with Kelli and her parents. It was pretty amazing to see and hear the variety of rhythm and music composed from the sounds of brooms, chairs, PVC piping, and match boxes, just to name a few. The biggest surprise came when I began to realize it’s as much a visual narrative as it is about the sound. Here is my sneaky snap shot that I took at the end of the show (photographs are discouraged). I assume it’s because flashes and LCD screens are distracting, so I made sure to turn both off. A short video showing the entertaining robot, Titan. Titan the robot is the new and unique entertainment concept that has taken the United Kingdom by storm. Titan is equally at home in almost any arena and switches from street theatre to corporate hospitalty with ease. In fact the events Titan has previously appeared at have spanned almost every possible genre including large outdoor events, product launces, celebrity partes, trade shows, shopping centres, music festivals, fashion shows, and even several TV appearances and has even been used in a national advertising campaign by one for the UKâ€™s largest holiday companies. Titanâ€™s allure spans all age groups, ethnic backgrounds and languages, he really does have a universal appeal; we have yet to find an event where Titan doesnâ€™t fit in. Hit play or watch Three Robotâ€™s Dancing at Youtube. I’m excited to watch tonight’s episode of The Wire (The best TV show ever). As always, urbanfervor has a fantastic review. (Spoiler Warning). The CBC has started podcasting The Vinyl Cafe. 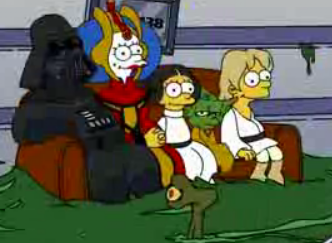 Clever illustration and animation guy Rich Cando created this Simpsons/Star Wars mash-up that I think youâ€™ll enjoy. Accept for maybe a touch of tweaking in the animation itself, I donâ€™t think Groening and crew could have done it much better themselves.